Kelly, Stephen (1993). 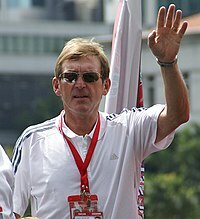 Dalglish. Headline Book Publishing; New edition edition (19 Aug 1993). ISBN 0747241244. Dalglish, Kenny; Winter, Henry (2010). My Liverpool Home. Hodder & Stoughton. ISBN 9781444704198. Macpherson, Archie (2007). Jock Stein: The Definitive Biography. Highdown; New Ed edition (18 May 2007). ISBN 1905156375. หน้านี้แก้ไขล่าสุดเมื่อวันที่ 17 พฤศจิกายน 2561 เวลา 06:46 น.